When Apple removed the headphone jack from the iPhone in 2016, many consumers were understandably panicked. How would they use their headphones? Today, there are a large number of wireless headphone options that use Bluetooth to connect to your mobile devices and are arguably more convenient than traditional wired headphones. So, what is true wireless and why should you use them? We’re here to help you make a decision on what might be best for your needs. Wireless headphones can be used for a variety of activities, including gaming systems, smart phones, computers, TVs, and other newer electronic devices. They are used around the world each day by people while working out, watching tv at night without waking others, listening to music during a lecture, and people generally enjoying the freedom that wireless headphones give. Below is everything you need to know about True Wireless headphones in 2018. The first thing you should know is pretty obvious: “wireless” and “true wireless” headphones are actually different. The important distinction is that “true wireless” headphones completely lack a cable or connector between the earpieces. “Wireless” headphones are still connected in some way (over-head like Bose, or around the back of the neck (like many sports sets), but no longer need access to a phone jack. Why Should I Go Wireless??? Having a cord in the way can be a constant nuisance while moving about, whether you’re at work, working out, cooking or even just going about your day-to-day routine, true wireless headphones help eliminate this hassle. With ever increasing Bluetooth range (distance between wireless headphones and your device can be upwards of 30 feet while still keeping a clear connection) and wireless headphone models that feature portable music storage, you can feel free to move around untethered from your phone. Some accompanying charging cases even double as power banks for mobile devices. How many times have you had to untangle a headphone cord after it’s been sitting in your pocket or bag? Often, even “tangle-free” or fabric-covered corded headphones are difficult to unwind. Thankfully, this is a complete non-issue for wireless headphones. No need to plug in, pairing your Bluetooth earbuds with your device is easy. Like riding a bike, once you learn how, you can do it easily with any device. For most wireless headphones, once your true wireless earbuds are set up and paired to your device, they will automatically sync the next time they are turned on for use. But, how do true wireless earbuds work??? How exactly do we get the music from your phone to your ears without anything between? Sounds pretty tricky, like magic! While Bluetooth connectivity may seem like a kind of wizardry, it’s actually very simple and straightforward. Bluetooth technology sends a signal kind of like an old school walkie-talkie or a radio. Your earbuds act like a tv dish, catching the signal and playing it appropriately. Just like a radio or tv, sometimes earbuds need to be adjusted in your ears to catch the signal best. Make sense? What’s the music quality like? Bluetooth has improved drastically since it’s debut, and wireless headphones can now receive CD quality audio. This, when combined with noise isolation and echo reduction and for some models, active noise cancellation, has produced great sound quality in wireless headphones. There is some current discrepancies between top headphone brands about what audio standard should be used; Qualcomm’s standard is AptX HD, Sony is pushing LDAC, and Apple advocates Bluetooth AAC encoding. Compatibility with your smartphone can impactful as well. With enhanced Bluetooth 5, many new headphones launching in 2018 will have improved connectivity and quality. Yes, the Bluetooth used in wireless headphones works similarly to WiFi but its frequencies are very low and are not considered dangerous for human use. For reference, they emit such a low frequency that it’s a thousand time less than a standard cell phone. If you’re worried about wearing a Bluetooth headset while driving, we would generally suggest that you be more cautious and limit any distractions you might have. However, if you must answer a call, it is much better to take it hands-free with a Bluetooth headset. In light of the Samsung Galaxy Note 7 exploding batteries issue, users might be understandably concerned that other lithium-ion battery powered devices - like most wireless headphones - might cause harm. However, this is an unlikely occurrence. Some additional preventative measures would be to keep your wireless earbuds in a protective case (like the Rowkin case) or to make sure that your headphones are not exposed to drastic temperature changes. Can the wireless earbuds last ALL day long? When the first cable-free models appeared, one of the biggest complaints was poor battery life. Even today, battery life is arguably the weakest spot of all true wireless gadgets even when compared to wireless headphones. Part of the reason for this is because maintaining connectivity between the earbuds as well as with your phone is intensive on the battery of the earbuds. Another reason is that the smaller form factor makes it difficult to fit in a large battery. So far, the longest estimated battery life available is seven hours. The majority of the “true wireless” models typically available can last between three to five hours. Luckily, many manufacturers managed to find a solution for short battery life – charging cases for “true wireless,” and for the “wireless” models, some manufacturers put an extra battery in the cord! Almost all “true wireless” headphones come with a charging case that can charge both earpieces simultaneously. Most of the cases actually carry between two-15 or more extra charges, so you can charge your headphones on-the-go or even charge your mobile phone when it’s running low on power. Are True Wireless Headphones workout-friendly? One of the main reasons people choose to buy true wireless headphones is to eliminate the hassle of adjusting wires and being tethered to a device while working out. The majority of true wireless headphones are suitable for exercise and are water- and sweat-resistant to a certain degree. This means you can put your device down, listen to music, and enjoy having the freedom to roam or move around the gym unrestricted. Some models that feature bone conduction can be used even while in a swimming pool. Hold on, what if I lose the earbuds? “I haven’t even bought them, but I’ve lost them already” - is a common joke to hear regarding small true wireless earbuds. Many potential users of true wireless headphones share one concern – what happens if you lose an earpiece? Believe it or not, losing an earpiece is much harder than it seems -- most pairs feature secure in-ear hooks to help keep them in place. The majority of wireless earpieces are slightly larger than their wired companions, but they are still lightweight and comfortable. So, losing an earpiece while walking or running is highly unlikely. 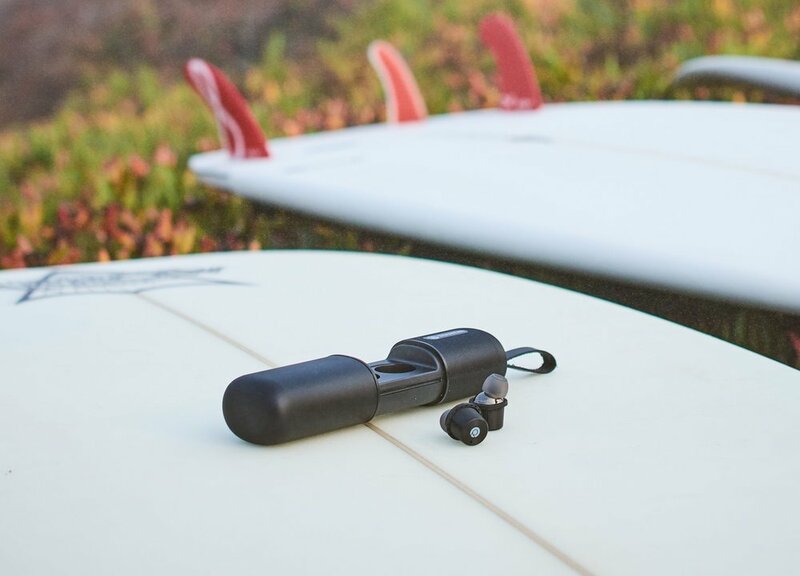 Some true wireless earbuds, like the newly released Rowkin’s Ascent have accompanying app equipped with a handy “Find My Earbuds” feature that allows you to easily locate where your earbuds were last powered “on”. If you do still manage to lose it somehow, many companies (such as Apple or SOL Republic) will sell you a replacement earpiece for a price slightly lower than that of a new set. What’s new with true wireless? Bluetooth 5 is the new standard of Bluetooth connectivity. With the rollout of Bluetooth 5 in more devices, this means there will likely be improvements across the board in connectivity, battery life, and range. Wireless Qi charging options (meaning wire-free charging) for your wireless headphones and type C charging is also a popular new feature. Also, there are various audio quality standards promoted by Apple, Google, Sony and other top players, but it remains to be seen which will be the dominant one used throughout the industry. There are currently very few true wireless options that feature active noise cancellation, other than Sony’s 1000x WF earbuds, and this may change as new models continue to roll out. Technology has evolved so that you can now wirelessly charge your wireless devices. Confused yet? Wireless charing, also known as “Qi Wireless Charging” (pronounced CHEE) works via electromagnetic reduction. They’re best for people who value simplicity, convenience, and aesthetic. The good news is, there are many inexpensive options for wireless charging. Take, for example, the Rowkin WAVE Qi Wireless Charger (compatible with any Qi-enabled device or your Rowkin Ascent Charge earbuds). For wireless laptop charging, check out the CES 2019 Innovation Award Nominee, Smart Energy, and their EnergySquare Universal Charger for Laptops! And there you have it! You now have everything you need to know about true wireless headphones before you decide to buy a pair. They may have a few flaws, but they still have many advantages. Wireless headphones are practical, have innovative design and, in many cases, provide better sound quality than wired headphones. Are you ready to throw your old headphones away and go wireless? At Rowkin, we’re excited about the just launched Rowkin Ascent headphones which will are now available at Rowkin.com, Amazon, and Best Buy. The super small Rowkin Ascent is water resistant, has a premium metal finish, an ergonomic fit, and even a “Find My Earbud” feature. It’s also equipped with Qi charging with a type-C connector. So, what are you waiting for? Go wireless!